Heat 1 or more tablespoons of oil in a skillet and saute parsley and fresh mint over medium heat for 2-3 minutes. If you are using dried mint, first saute parsley and add the dried mint for the final minute. Set your parsley and mint mixture aside for now. 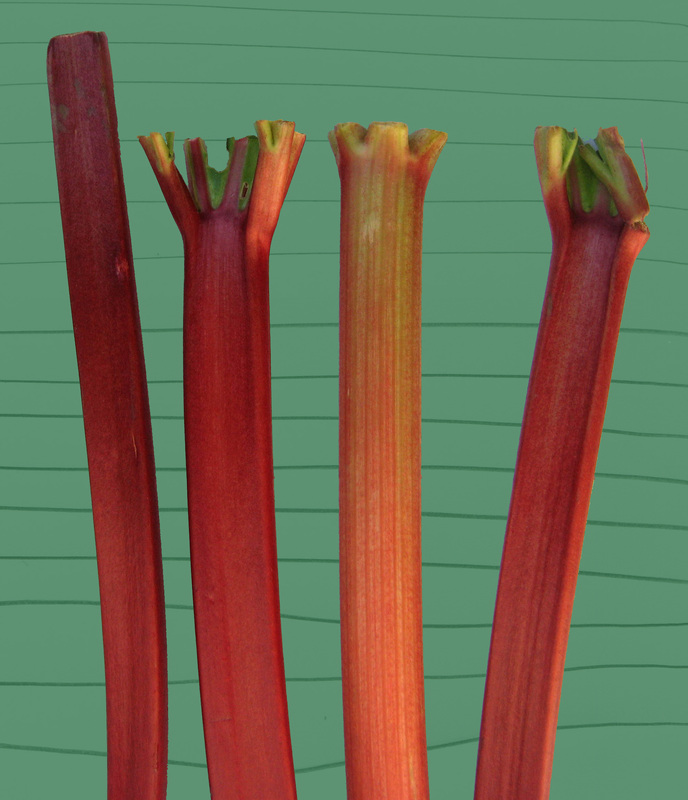 Wash rhubarb stalks. Dry. Peel off the thin-germy-film of the outer-skin of stalks and remove strings. Cut stalks into 1 to 2 inch pieces. 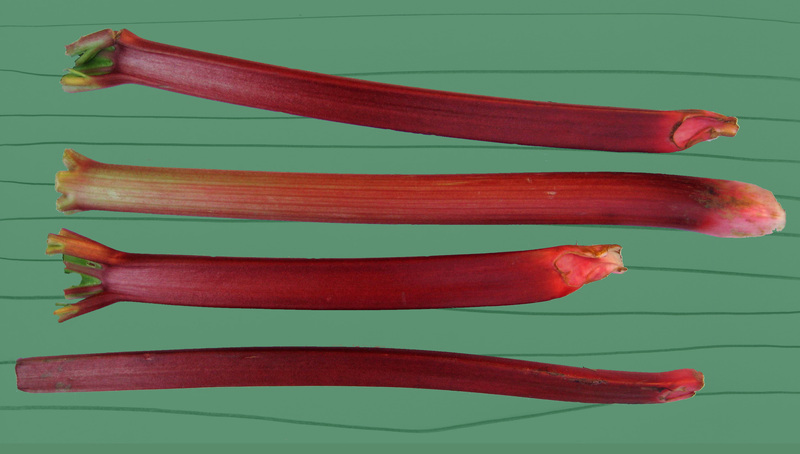 (A 1 inch piece is typical but Maman prefers it for aesthetic reasons and also because the larger-size prevents the rhubarb, which despite appearances is a rather delicate vegetable, from falling apart when it is cooked.) Set aside for now. Add meat to the onion and saute over medium heat for 5-6 minutes or until each piece of meat is browned on all sides. (Tip: if necessary, add more oil or 1-2 tablespoons of hot water to avoid burning it.) If you are using the grated ginger and garlic (optional but nice) add those half-way through this step of browning the meat. Add 2 1/2 cups of water to the pot, salt to taste, and bring to a boil. Cover and cook over low heat, stirring occasionally, until the meat is tenderly cooked. (Usually takes one hour, give or take, depending on the type of meat used.) Halfway through cooking the meat, add the parsley and mint mixture prepared earlier. Now is also the time to add the dissolved saffron – if you are availing yourself of this festive option. Stir gently to mix with the meat, cover, and continue to cook until the meat is done. Make it, and enjoy it, and noosheh jaan! Never knew that about adding salt to onions. Good to know. 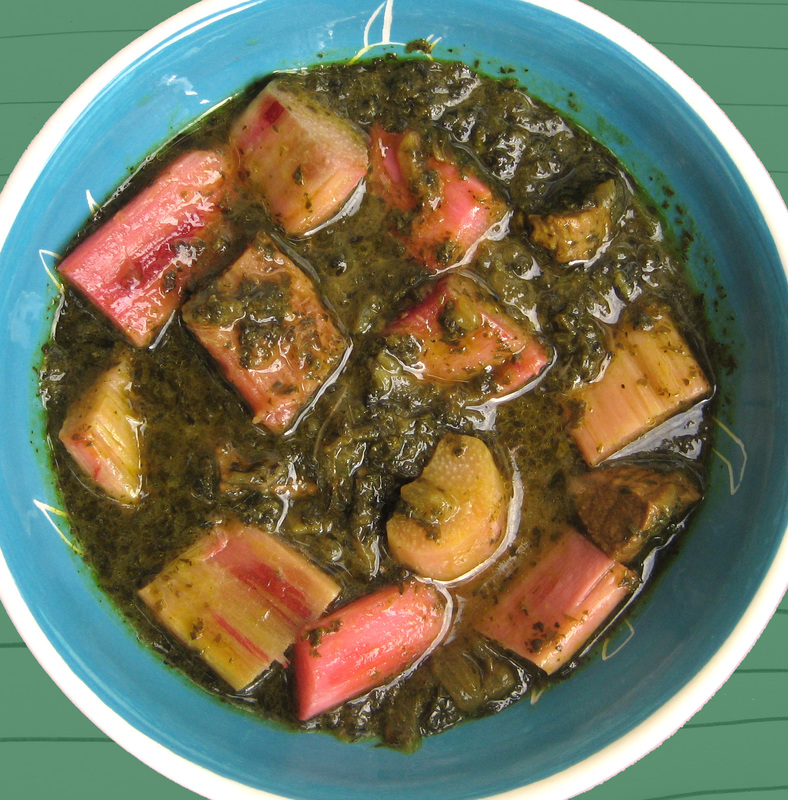 I cooked rhubarb a while back with duck legs and it was sooo good. This sounds equally delicious. Will have to wait to try this another time. Hoping to cook your apricots as a warm salad tomorrow and stuffed Portabello mushrooms. Will let you know how it goes! An old trick of my mother who picked it up from that old reliable cookbook of hers! So cool! I’ve never used rhubarb in anything other than sweet applications, so I’m quite interested to try this. I bet it’s phenomenal with lamb. Thanks for the inspiration! 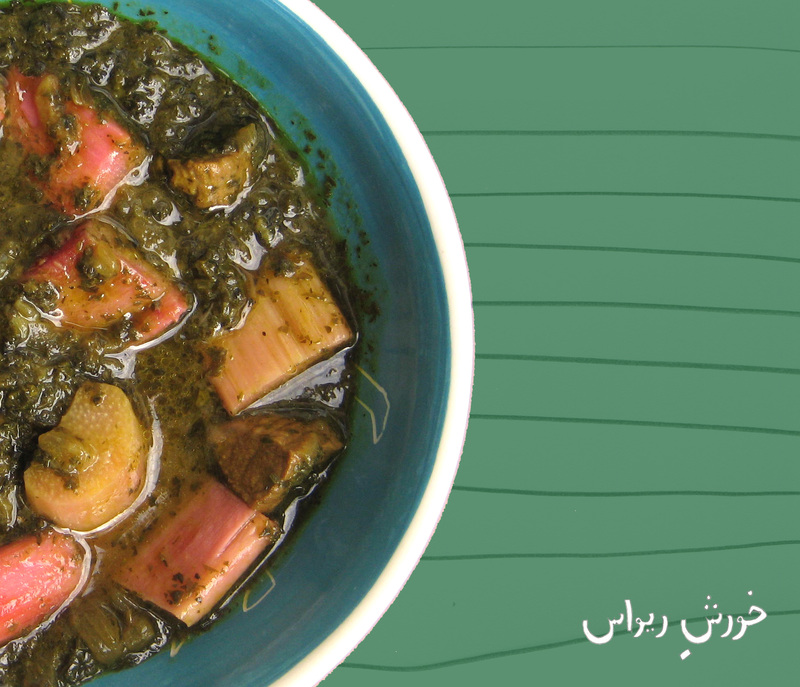 Beth, this is a classic Persian stew and it’s really delicious. If you like a bit (or more) of tart flavor with your savory. If you do make it let me know how it goes? Would love to hear! My Maman loved this dish. Yummy! Razak – if you do, let me know how it turns out! thanks for finding my blog so I could discover yours – this looks FANTASTIC. Will make it soon, for sure! What an interesting dish! I’ve never had anything like this! I got all excited to make this, and my grocery was out of rhubarb. I used this recipe as a starting point, though, and used beet stalks instead. It certainly won’t be as good as rhubarb, but it will be hearty. Interesting! I am curious to know how it turned out with beet stalks. Rhubarbs come out juicy and a have a meat-like texture. Thank you for letting me know TaffyDacks! & Noosh ‘eh jan! skin tone that will turn yellowish if fatty acids are allowed to oxidize. nearly all users are pleased with the results. forr a related subject, your web site came up, it looks good. Hello there, simply changed into aware of your weblog through Google, and found that it is really informative. Hello friends, good post and fastidious urging commented here, I am genuinely enjoying by these. 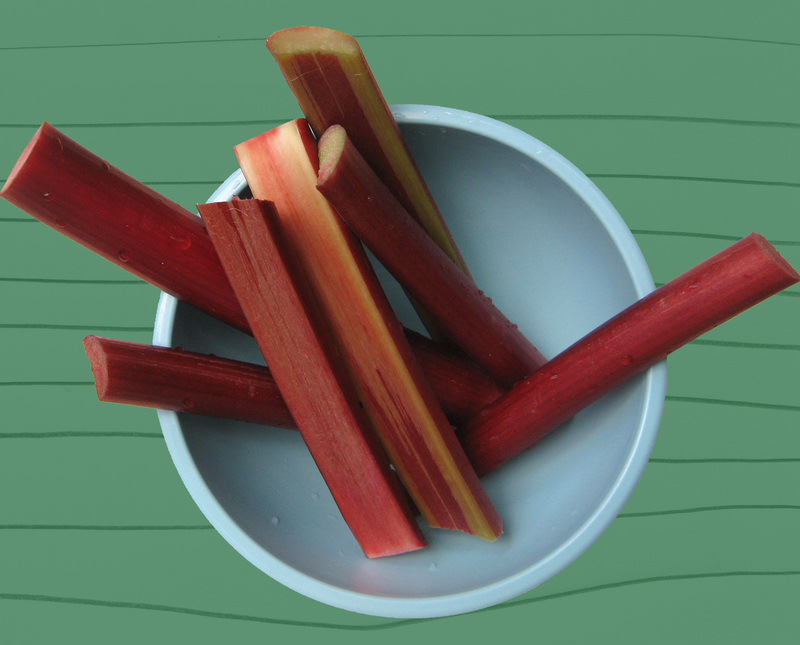 yum definitely want to try this when Rhubarb season arrives here in California!